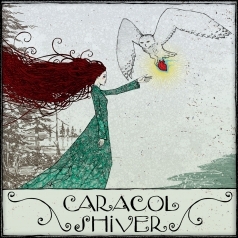 ◊ Caracol’s new album Shiver is one that won’t leave you out in the cold. With 11 songs about love and heartbreak, Caracol’s impassioned vocals are warm and strong in her new release. ◊ Her third album and first English release, Shiver is full of emotion. From the undeniably cute folk-pop song “Sailor Boy” to the blues-rock inspired “Kiss of a Fool,” the album features a range of feelings as wide as the genres influencing Caracol’s performance. Admittedly, Shiver features lyrics that can be cheesy. Lines like, “Go away from me, my lonesome heart” from the aptly named “Summer Blues” seem ripped from the pages of some heartbroken high school kid’s diary. ◊ Caracol makes up for this slight artistic misstep in the lyrics with her wispy, honeyed vocals. Her subdued vocals keep a consistent mood on most of the album — tracks like “All the Girls” and “Sabres of Truth” benefit from the delicacy of her voice. But compared to the powerful vocals she demonstrates in “Kiss of a Fool,” it seems a shame she didn’t bring that side of her voice out more often. ◊ Montreal-based indie folk artist Caracol has recently released her new English album Shiver, which could have been a risky move on her part. Luckily for her, it wasn’t. The release of Shiver marks her first English-dominated record, though she has seen success with her French musical career for some years now. ◊ The album features eleven tracks, five of which are from her 2011 album Blanc Mercredi. Two of these songs, Blanc Mercredi and Certitudes, contain French vocals and were likely included on the album to resonate with her already-established fans. That is not to say, however, that new fans wouldn’t enjoy these tracks- Certitudes has quite the catchy instrumentals that will entice listeners regardless of whether they can understand the lyrics or not (Blanc Mercredi does mean White Wednesday, right?). ◊ The album includes six additional new English tracks, including Sailor Boy and The Sabres of Truth. The latter contains heartfelt vocals that will literally make listeners shiver in their skin due to the rawness of Caracol’s voice accompanied only by an acoustic guitar. ◊ It will only be a matter of time before Caracol begins to see success with her vintage-like album, Shiver. © Grosse prise de son pour petit instrument.